So, where I was going with the whole laundry thing, is that Monday is usually my pick up the house/laundry/get on top of everything day where my main focus is solely on the "mom" parts of my life. Hence the Monday is "Mom"-day. I thought I would kick off this first "Mom"day with a couple pics from my baby's b-day last week. 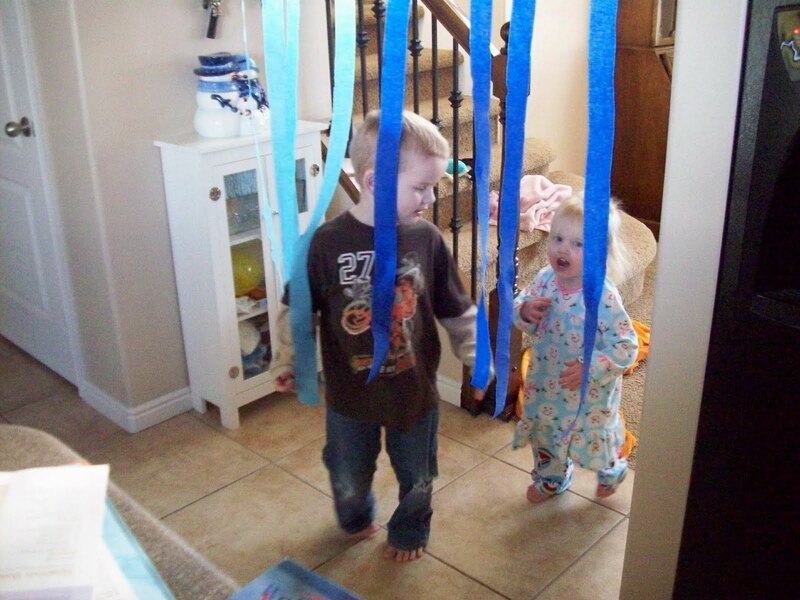 Her older brother and sister wanted to hang up the streamers. I was hesitating. Why? I don't know. Tape on the wall, streamers shredded all over the house, just one more thing to manage. But I made myself get over it and just let them put it up for their sister. As you can see, she loved it. 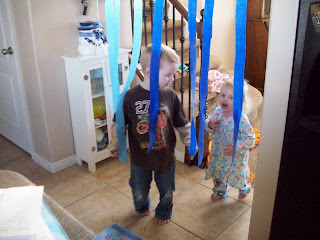 The two little ones spent almost an hour just running back and forth through the streamers. The next picture is the treat we had for the "party". 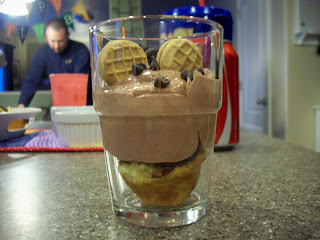 It's a mini cupcake with chocolate pudding mixed with cool whip and toppings of the kids' choice on top. (their options were mini cookies, mini choc chips, mini marshmallows- sensing a theme? it was totally un-intended) I put them in these little glasses I bought at IKEA ($1.50 for 6) and the kids thought they were great. Simple and fun. I'm going to try harder to just let go and do things that the kid's want to, even if there's a mess involved. Amy, it is definitely hard to let go of worrying about "mess" and let the kids be kids! I like the streamer idea, I might pick some up for a snow day! I do one load of laundry a day - it is the only way I can face it. I only do laundry on Mondays, too! I hate laundry, so I love not having to worry about it more than one day a week. And iron?!?! The only thing my iron gets used for is fabric:) I'm not kidding. The cupcake treat is a cute idea. I'll have to try that with my girls sometime. I am trying to do the same thing as far as messy kid stuff. I found myself saying no way too often for no real reason. So, my couch and loveseat are torn apart daily to build forts and castles. I don't say no now to painting and playdough as often. I let my oldest use an entire notebook of drawing paper in one sitting if she feels so inspired. And she does... frequently. I like the idea of Mom-day. Can't wait to see what you do next Monday!